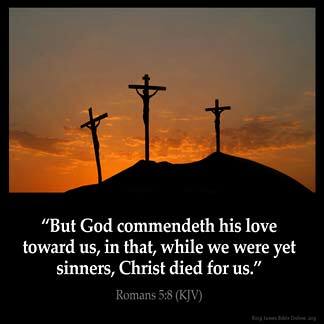 ROMANS 5:8 KJV "But God commendeth his love toward us, in that, while we were yet sinners, Christ died for us." 5And hope maketh not ashamed; because the love of God is shed abroad in our hearts by the Holy Ghost which is given unto us. 6For when we were yet without strength, in due time Christ died for the ungodly. 7For scarcely for a righteous man will one die: yet peradventure for a good man some would even dare to die. 8But God commendeth his love toward us, in that, while we were yet sinners, Christ died for us. 9Much more then, being now justified by his blood, we shall be saved from wrath through him. 10For if, when we were enemies, we were reconciled to God by the death of his Son, much more, being reconciled, we shall be saved by his life. 11And not only so, but we also joy in God through our Lord Jesus Christ, by whom we have now received the atonement. But God commendeth his loue towards vs, in that, while we were yet sinners, Christ died for vs.
but God commends *his* love to us, in that, we being still sinners, Christ has died for us. But God gives proof of His love to us in Christ's dying for us while we were still sinners. Ro 5:8 But God commendeth his love. His love is not like human love. Christ died, not for friends, but for enemies. It was "while we were yet sinners" that he died for us. I think it is amazing we all want to be love, we should not be selfish with our love. We should consider others we do not have to like the way they treat us be a Christian love them any way. Just think about the way we sin and break God 's law He still love and give changes after changes .